Last week I called into my favorite second hand record store, as well as a huge selection of records, they also have DVDs and Blu-rays. One such blu-ray caught my eye was this one, still sealed and brand new for $10 about five pound. Disc one was Part One of the 3D version, with a nice 1:75:1 picture ratio. Disc Two was the second part in 3D. Disc three was the 2D version, with Disc four with the special features. 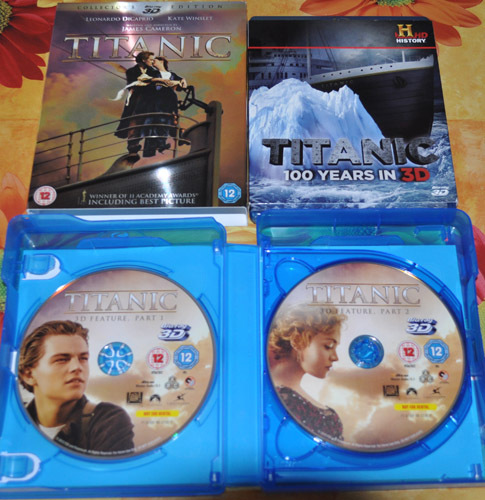 All up this four disc blu-ray "Titanic" was incredible value. With a feature length of 194 mins, I was wondering how I would last using the Epson 3D glasses. Thinking I would just watch disc one and watch the second disc another night as it might be a bit much. James Cameron and his team in producing a 3D version of his film, has done a amazing job on this transfer, also the 1:78:1 3D ratio was just right for the Epson VP and me. I should add that Disc three, the 2D version gives you the full 2:40:1 ratio. To sum up "Titanic" in 3D, its fantastic to watch, and as such I would very highly recommed it. Nice find Graham. A great movie! The price on a lot of blu-ray has been dropping for a while now, second hand discs can go for $5 to $10 dollars. Its interesting with the 3D in particular, as even brand new the price can be around the $15 mark. However the more expensive discs in time do drop in price, so its just a matter of picking them up when the time is right. One 3D Blu-ray that I watched a while ago was "Passengers" I hope that one day, they might release JAWS and others older movies in this format. Watching "The Wizard Of OZ" certainly proved to me the present technology is up to doing it and doing it well. yes I have had that 3D conversion - Titanic - for some while and it is stunning...adds a completely different element and spectacle to a great movie. I too would love Jaws and the original Blade Runner given the same treatment too. Another 3D Blue ray worth watching is 'Alice in Wonderland' with J. Deep. The TITANIC set has 4 discs in. Thanks Colin for that suggestion regarding Alice In Wonderland "Johnny Depp" on 3D. I will look out for it . Last year before I even got the 3D glasses, I had my eye on picking up 3D discs. I did feel at the time though, that I was taking a chance on the older movies like Jurassic Park. The reason was that I was disappointed watching them at the cinema, and came to the conclusion, that unless it was made in 3D I would avoid them. The Jurassic Park four disc collection that I bought below, included "Jurassic Park" both in 2D and 3D, also included was "Jurassic World" in 2D and 3D. Great value for only $9 brand new. Anyway I try to balance out watching movies on the silver disc on some nights, and on others watch Super8, 16mm and 35mm film instead.